We recommend three ski schools in Oz en Oisans: ESF, Active, and SkiaOz. 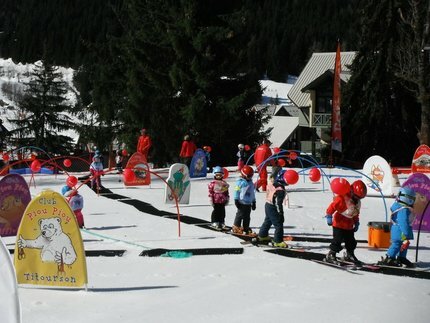 Ski kindergarten is for ages 3-6 and this can be combined with creche, with the ski school & creche working together to arrange for children to be dropped off or picked up. This takes place in a colourful fun garden with inflatable toys & obstacles. For older children, the ESF runs the established french ski school star system. See their site for more details. Barbara from Active ski school speaks fluent English. She offers private coaching for half or full days, with a maximum of 5 people, to keep the quality of tuition to its best. Ideal for groups of families or friends. SkiaOz offers ski and snowboard lessons to all levels, off-piste excursions, ski touring around other local resorts and guided starlight evening snowshoe walks to a mountain chalet restaurant. Provided by an independent, fully qualified ski and snowboard instruction.